There are a lot of Parkinson's fitness programs out there, including Rock Steady Boxing, and there are a lot of reasons why I love them. However, If your only source of Parkinson’s exercise is a group fitness class, you may be doing yourself, your brain, and your future a disservice. Here walk through 3 questions to ask about your group fitness class to see where you can improve. Cycling and Parkinson's - Should You Consider this Spin on Exercise? Have you heard all the hype about cycling for your Parkinson's symptoms? Are you curious what the research says about cycling for Parkinson's or how to get started? 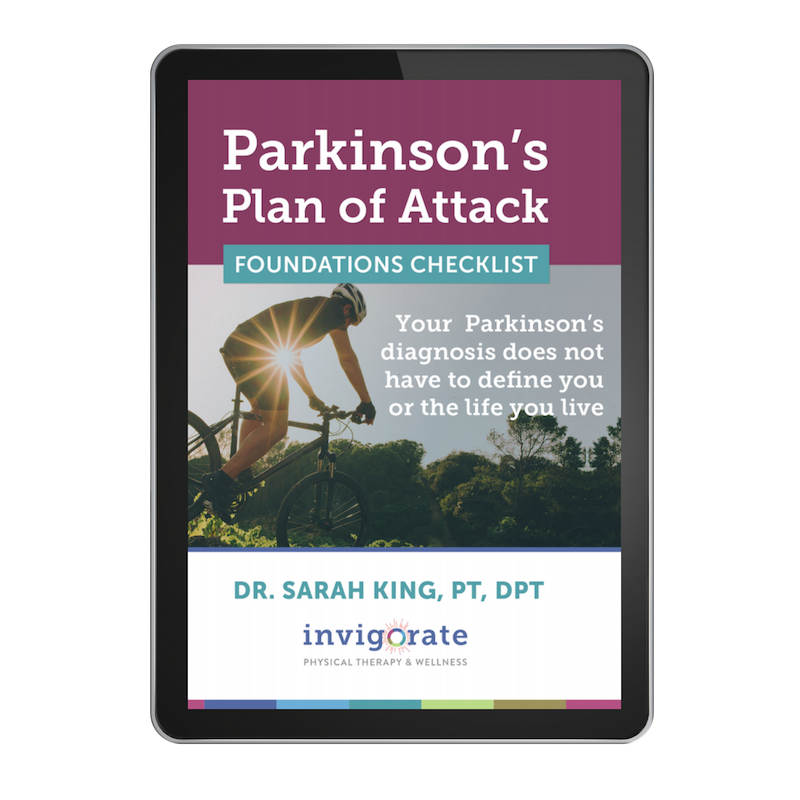 In this post I’ll walk through a variety of options for you to explore the benefits of cycling for Parkinson's, no matter what stage of your Parkinson’s journey you’re in or your activity level. Looking to start a Parkinson's exercise program, but not sure where to start? We've got you covered. We prepare our cars, RVs, boats, and homes for the chillier winter months, so why not do the same for our bodies? Any healthcare practitioner will tell you: The end of the year is notorious for knocking people off their game. The good news is that there are 3 simple ways to "winterizie" your immune system now so you can spend the holiday season with your family, not the hospital staff. "What's the best kind of exercise for Parkinson's?" My first answer? The kind of exercise you'll actually do. My best answer? ANY kind of exercise is beneficial for Parkinson's, so long as it has these 7 elements. My Video Interview with Colin Potter: "How I Reversed My Parkinson's Symptoms"
Dr. Sarah King, PT, DPT interviews Colin Potter about his experience being diagnosed with Parkinson's Disease and his hard fought battle to reverse his Parkinson's symptoms. He talks about the revelation he had to spur his new journey, what changes he's made to reverse his symptoms, and what his plans are for the future. Colin Potter, founder of Fight-Parkinsons.org, came to Austin to further his research into the causes and natural alternatives to fighting Parkinson's Disease. He took time to lead a Walk and Talk to discuss his journey and how he's combating his symptoms in ways that go beyond the pill bottle. Having Parkinson's can be an expensive endeavor. When you add up the cost of medications, doctors visits, and the like, your pocketbook can take a serious hit. When I started working with my Parkinson's clientele, I knew I would have to find some way to provide a challenging, diverse exercise program that they could continue on their own after they "graduated" from our program that required little to no financial strain. This $11.36 solution was just what the doctor ordered. After a diagnosis of Parkinson's Disease, often patients will put off seeing a physical therapist because they're "not that bad". One of my clients, Jennie, was exactly this way. This is Jennie's story. My intention of sharing her story (with her approval, of course) is to help people with Parkinson's understand that it IS possible to regain strength, stamina, and balance that they feel like is lost forever (and you don't have to be in therapy forever to achieve it!). It's never too early or too late to start re-writing your Parkinson's story. When one of my clients decided to purchase a TheraCycle exercise bike, I started recording her experience so that other's who are considering purchasing a bike can see what the process is like. From first phone call to first workout, we track Sandy's experience and progress.